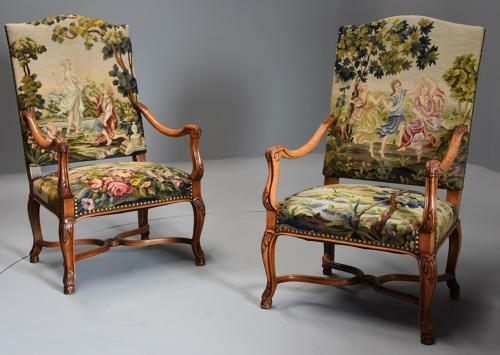 These chairs comprise of a decorative tapestry upholstered back with Classical scenes with a shaped top rail leading down to shaped arms and armrests with carved foliate decoration. The seats are also upholstered with Classical tapestry designs with stud decoration and lead down to four cabriole legs with carved foliate decoration terminating with a scroll foot and supported by a shaped X stretcher. These chairs are in very good condition, are of stable construction, the upholstery is in very good condition and can go straight into a home.